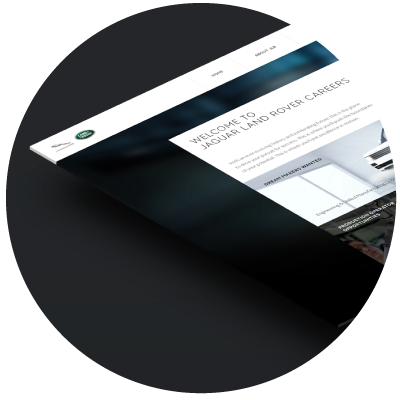 Jaguar Land Rover’s new employer website launched in 2013 in line with their new employer brand ‘Excellence In Motion’. To meet the needs of a rapidly evolving business, changing candidate behaviour and a new brand direction, the site needed a complete overhaul in 2015. Experienced professionals. Skilled trades. Graduates and Apprentices. With so many roles and such a diverse audience, we needed to ensure the website appealed to a variety of users. Before the update, the homepage became cluttered with multiple promotions, causing too many calls-to-action. So it became our main aim to simply improve the overall candidate experience, keep candidates on the site for longer and convert visitors to the site into applicants. The site is packed with premium technological features, from being fully responsive to parallax scrolling. Key social campaigns and time-sensitive tweets are given prime real estate on the homepage. Giving users a current picture of the latest JLR news and job roles. With so many different roles across all business areas, we needed to ensure the website appealed to users of any age and any career level. And for younger audiences, this meant optimum compatibility with the latest smartphone and tablet devices. The website has been structured to allow very niche departments to be brought to the forefront without compromise. These pages are also linked from media campaigns allowing the full JLR employer brand experience to be tailored for specific target audiences. Due to the ATS provider’s lack of features (limited rebranding, non-responsive vacancy search, inaccurate analytics), we integrated raw data feeds into the website and created a bespoke solution created purely with the candidate in mind.